Megan and I arrived Wednesday evening in Portsmouth New Hampshire, our Skybus flight touching down in a light fog. We picked up our rental car, and headed up I-95 to Portland, onto Gray, and then finally to Maine Rt. 26 which would take us up into the Oxford Hills. 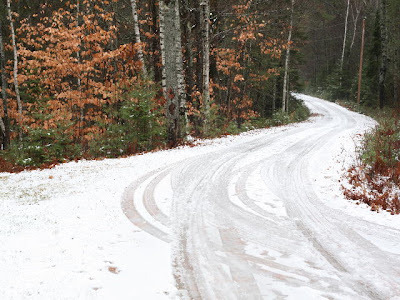 Of course, when we got to the Oxford Hills, we were greeted with this funny wet white stuff covering the ground. Plenty of snow here! Here is Megan's parent's driveway, looking OUT towards the street. Yep, they are fairly isolated, and it is pin drop quiet in the woods here. Little pond is pretty far north, north enough to have a nice mixture of pines and hardwoods. There are no less than seven species of conifers to be found on the property, and American beech, red maple, and paper birch are quite common. The bog and pond, the namesake of Little Pond, were quite eerie yesterday! We started out with clouds and rain, but as the day grew older and warmer, fog set in. 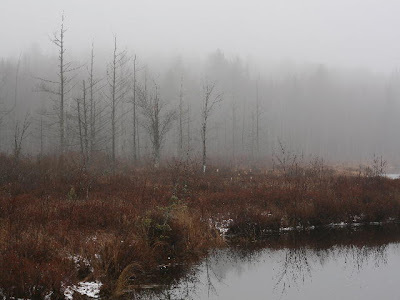 I could barely see the pines on the other side of the bog through the misty fog. What better activity in Maine on Thanksgiving than a hike with the dogs? Dublin and Murphy, the resident chocolate labs of the property, are a bit rambunctious. Here are Megan and here Dad on a walk. 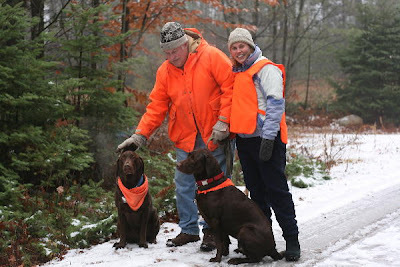 I guess its gun season here in Maine, so blaze orange was the thematic color of the day. And what better way to round out a Maine thanksgiving with a nice goose taken on the pond that morning? Ok...not really. But it sounds good, doesn't it? 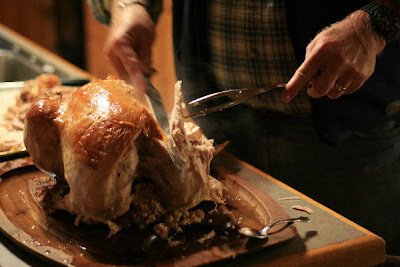 No goose, but here is Glenn carving the turkey. All in all, a nice thanksgiving, and I want to put out a shout out to all my family back in Ohio. Lets see your pictures!